Here’s a round-up of the Irish in action on day four of the Games. Dunlevy and McCrystal after finishing fifth. 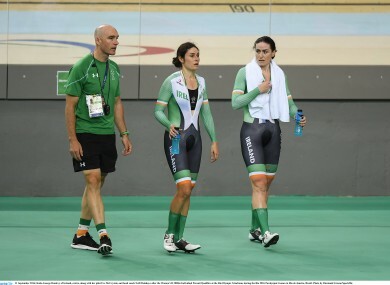 AFTER THEIR QUEST for Paralympic glory ended in disappointing fashion, Irish track duo Katie-George Dunlevy and Eve McCrystal suggested that a lack of a velodrome facility back home attributed to their downfall. The pair recorded a personal best time in this morning’s Women’s B Tandem Individual Pursuit but fell short of qualifying for the final with a fifth placed finish; their time of 3.33.471 meaning they missed out. With only four bikes to advance to Sunday night’s medal races, Dunlevy and McCrystal were left heartbroken, particularly after they were in the top four with a lap to go. “We’re disappointed,” McCrystal said afterwards. “We’re here to get in the medal ride-off, for gold and silver; we believed we could do it. We were aiming to get a personal best today, but it wasn’t good enough on the day. “We train on the track when we can, and go to camps in Majorca, but it does go back to not having that velodrome at home. It would make such a difference if we had one, there’s only so much you can do with limited time. “We were up against two nations who train full time in the velodrome, hopefully our advantage will be the time trial [on the road]; it doesn’t cost to train on an open road. Meanwhile, in the Men’s B Tandem Kilo Damien Vereker and Seán Hahessy finished in eighth place with a PB of 1.06.370. Monday and Tuesday sees a break in the cycling schedule before all seven Irish bikes are in action on Wednesday in the time trial. Elsewhere in the swimming pool, Ellen Keane made her Rio debut and despite an impressive swim in the SM9 200m Individual Medley, did not progress to the final. Keane, swimming in heat three of the event, clocked 2 minutes 41.17 seconds but would have needed to swim under her best time of 2:39.95 to advance. Also in action today were para triathletes Catherine Walsh and Fran Meehan who were representing Ireland at Rio 2016 as the sport made its debut. The pair got off to a steady start in the swim, holding a solid 10th place position, before moving on to their more favoured bike, which saw them finish fifth fastest and move up the rankings. They went on to put in another steady performance in the run and finished eighth overall. Email “Irish track duo hit out at lack of velodrome at home after Paralympic heartache ”. Feedback on “Irish track duo hit out at lack of velodrome at home after Paralympic heartache ”.